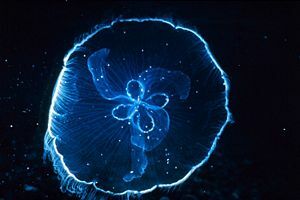 The Moon jellyfish’s body consists of a round flat shaped disk known as the bell because of its bell shaped structure, it is also known as the umbrella. 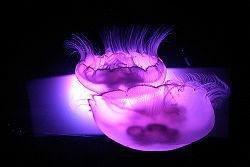 Recently some scientists have done some research on the jellyfish and how temperature can effect its growth. At the temperature of about 21 celsius showed the greatest growth change in the jellyfish where as the temperature of 8 degrees celsius slowly decreased the size of the bell. 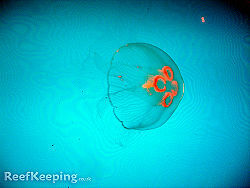 [] Located below the bell are the jellyfish’s mouthparts and the sub umbrella. On the opposite side is the exumbrella. The oral-aboral axis reaches out from the middle of the aboral surface to the middle of the oral surface which then shows its central line of symmetry. The outside of the bell is slightly indented in eight different spots so it may appear to some as a scallop. Within the indentations are sensory complices or the rhopalia. The stomach, otherwise known as the coelenteron consists of many chambers and a channel coated by ciliated gastrodermis and goes through the mesoglea and then opens the exterior by using the mouth. It is separated into two parts and is used to transport fluids as well as the digestive system. Invertebrate Anatomy Online Richard Fox, Richard Fox, Copyright 2001 . Moon jellyfish - Aurelia aurita Jessica Heard, Heard, J.R., 2004. Tank raised JellyfishJim Stime, Jr., Advanced Aquarist's , July 2007 . Marine Life Profile: Moon Jelly Waikiki Aqaurium, Unknown, Waikïkï Aquarium. This page was last modified on 9 November 2010, at 11:31.